These are perfect for my philtrum piercing! Yes, they are visible, but it's very difficult to tell unless one is close to the piercing. This is my first experience with bioplastic and I'm very pleased with it. The ends tend to bend if it is not straight going into the labret; patience is a virtue! Shipping was also very fast! Very satisfied overall with my purchase! I'm pale & this isn't even noticeable at all! 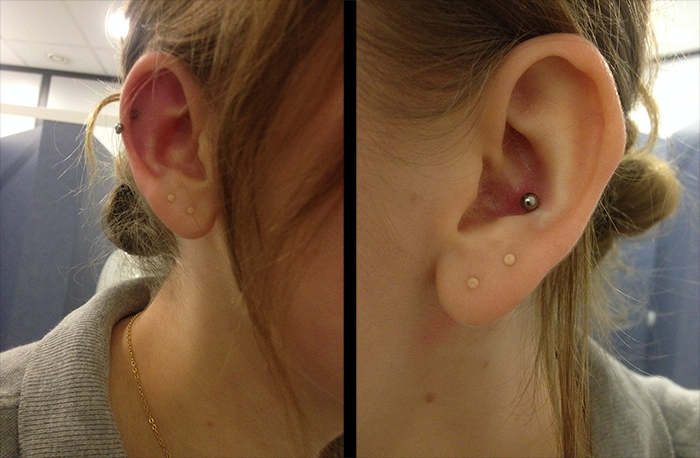 Love it going to get my 2nd one of this to 'hide' my other piercing regrets lol. I brought this to conceal my lip piercing while at work and at first I didnt think it would be as good as it is, it was so hard to see I even had a piercing at all! They fit very comfortably as well and were very secure. I did find them a bit fiddly sometimes to get the end in, but I think that was just where I am a bit heavy handed sometimes. Also, after a while the end did start to bend, but it didnt really cause any problems. My holes nearly close up after about a day of nothing in them, so I use 4 of these in my double lobes for work. The flesh tone is lighter than my skin, but not noticeable unless you're looking for them. My boss is a stickler for the "no multiple piercings" rule and still either lets it slide or doesn't notice. I ordered them on a Sunday and got a conformation on the following Monday, then got them the next Monday. Pretty awesome if you ask me - the fastest shipping I've come across. When I first saw the retainer, I was like "Oh no, it's going to be way too small!" but it's just the right length, I think. The skin colour of it matches my light complexion perfectly and it's interchangeable with the skin-coloured push-part and other accessories... excellent value for money. They'll hide my spiderbite piercings perfectly for work. I bought this for my nose piercing because the ends of retainers specifically made for noses often feel like they are pulling through the hole or actually just slide through regardless of what gauge I buy. It works a charm and is really comfortable on the inside of my nose. I got this to use for work and I must say its worked a treat so far, It's only noticeable from very close distance! This retainer is just the best! I was so worried when i started work, because I should remove my labret , but thanks to the retainer, I can hold it. It can be hardly noticed, only when you are very close. I am happy I found this shop and especially this product.